The front of Jakobshavn glacier. When scientists talk about Greenland losing ice, they are talking, in no small part, about Jakobshavn glacier. A frozen river that drains roughly 7 percent of the Greenland Ice Sheet along the west coast, Jakobshavn has been thinning and retreating in a dramatic fashion for about 20 years, and is the single largest contribution to the ice sheet’s climate change-driven slim down. But in 2016, the glacier did an about-face. For the past few years, Jakobshavn has been re-thickening and re-advancing toward the sea, according to research published Monday in Nature Geoscience. This doesn’t mean all is well with Jakobshavn—it still appears to be losing more mass than it’s gaining, and the slowdown is likely to be temporary—but it is causing researchers to rethink the factors that control the movement of this fast-flowing river of ice. “It’s a grand experiment 20 years in the making on large scale,” lead study author Ala Khazendar, a scientist at NASA’s Jet Propulsion Laboratory, told Earther, describing the glacier’s sudden acceleration and equally sudden slowdown. The drama with Jakobshavn began in 1997, when the glacier awoke from a period of stability and its floating tongue, or ice shelf, started to thin rapidly. In 2003, what was left of that shelf snapped clean off. Things continued to snowball from there, with the glacier picking up speed and spewing more icebergs, causing its front to retreat farther and farther inland as its surface dropped by over 500 feet (150 meters). Some suspected Jakobshavn’s future was one of unstoppable, ever-quickening demise. Evolution of the calving front of Jakobshavn glacier over more than a century. Following a period of stability from the mid 20th century to the late 1990s, Jakobshavn began to retreat rapidly. Now, Jakobshavn has thrown scientists a curveball. Using airborne altimetry measurements along with satellite imagery, Khazendar and his colleagues have shown that the glacier’s thinning started to slow around 2014. By 2016, it had completely reversed course and its front 19 miles (30 kilometers) were thickening at rates comparable to the earlier thinning. By 2018, the thickening had spread 50 miles (80 kilometers) upstream. “My first reaction was hey, we made a mistake,” Khazendar told Earther. He explained that his team was working with a new dataset from NASA’s Oceans Melting Greenland (OMG) mission, and they had to verify the findings with a separate dataset collected by NASA’s Operation IceBridge before they could be confident in what they were seeing. 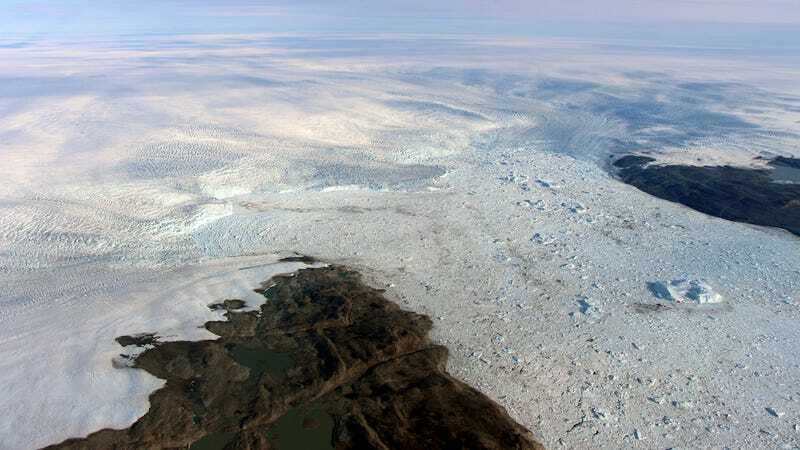 The OMG data, which includes ocean temperature information, helped shed some light on the likely cause of the reversal: It occurred right as a cold-water current making its way up Greenland’s southwestern coast reached the bay adjacent to Jakobshavn’s fjord. From 2014 to 2016, temperatures in that bay dipped nearly 2 degrees Celsius (3.6 degrees Fahrenheit), back to where they were in the 1980s. While the ultimate cause of the cool water intrusion is uncertain, one hypothesis is that it has to do with a switch in the North Atlantic Oscillation (NAO), a recurring climate pattern that can trigger cooler or warmer conditions across a wide area. Khazendar said that while air temperatures also seem to be playing a role, “ocean temperature variability was the dominant factor” in the new analysis. Jason Box, a professor in glaciology and climate at the Geological Survey of Denmark and Greenland who wasn’t involved with the paper, said that its conclusions “make sense” and build on work from 2008 showing that the initial acceleration of Jakobshavn glacier was trigged by an intrusion of warm, subsurface ocean waters. Mathieu Morlighem, a glaciologist at the University of California Irvine who also wasn’t involved, made a similar point. Morlighem agreed. “What is happening to Jakobshavn is probably a temporary hiccup,” he said. Hiccup it may be, but the findings still highlight there is more to this glacier than meets the eye. It’s been hypothesized that the geometry of Jakobshavn—it’s tethered beneath sea level on bedrock that gets deeper farther inland—makes it inherently unstable. This paper tells us there are other factors that influence how quickly it will recede in a warming world. Given the glacier’s outsized contribution to sea level rise, pinning down all of those factors and how they work together will be critical.